Part of the three great angry English men who burst out of the music scene in the late 70's (the other two were Elvis Costello and Joe Jackson), Graham Parker earned his chops on the famous pub rock circuit, which gave us Nick Lowe, Dave Edmunds, Brinsley Schwarz and much of the late Stiff label roster. While Costello drew from early 60's rock and Jackson rocketed across short, sharp songs, the always-in-aviator-shades Parker was heavily influenced by Motown and other soul music genres which he wore on his sleeve. He infused his rock periodically with Funk Brothers licks and reggae beats ("Don't Ask Me Questions"). With his mates, Parker played as a true band and their recordings were full of energy, a totally live vibe, and often with his own four-piece horn section. In the first years of his recording career on the Mercury label, Parker cut cover versions of soul classics like a stomping "Hold Back The Night" (by the Trammps), that had the twin guitar attack Thin Lizzy made famous, and The Jackson Five's "I Want You Back," which stays true to the original, as much as nobody sounds like Michael and his brothers! However, unlike those R&B songs he clearly loved, Parker was full of rage and agony. His lyrics showed a man who didn't believe in compromises in love and friendship, yet often felt betrayed. He didn't suffer fools, and wasn't afraid of sharpening that poison pen in his lyrics. He always had a penchant for two things: somehow bringing in the weather in his lyrics (often raining, with thunderstorms) and making his chorus the entire title of his song ("Passion Is No Ordinary Word," "Discovering Japan," "Stick To Me"). Parker's tunes were anthemic and bluntly confessional sometimes ("Fool's Gold" and "Pouring It All Out"). My friend John's college floor hockey team was named after Parker's "Heat Treatment" and blasted it before each game. Savvy artists covered his songs, notably his buddy Dave Edmunds ("Back To Schooldays" and "Crawling From The Wreckage") and what I consider to be the definitive version of his song "Thunder and Rain," performed on a long out-of-print album on CBS by singer/actress Ellen Foley (definitely the subject of a future post -- she belted the female date role in Meat Loaf's famous "Paradise By The Dashboard Light"). Parker wanted to break the US market in the worst way, and deservedly so considering his talent. Watching his buddy and former producer Nick Lowe climb on to US radio with "So It Goes" and "Cruel To Be Kind" didn't sit well with him. Finally, after he released a three-sided live album The Parkerilla to fulfill his contract (yes, in the vinyl days, you could do this! ), Parker moved to Arista Records. His first post-Arista signing recording was a bootleg single aimed right at the record company who he felt failed to promote him properly. Usually wrath is incurred towards ex-girlfriends and other creeps, but Parker packed all the venom he could to blast Mercury Records, which truly marked the end of his "pub rock and soul era." A collector's item (which I have somewhere in a box in my basement), the one-sided "Mercury Poisoning" single had a skull and crossbones on the label. And yes, this is probably the catchiest singalong record label blow-off you'll ever hear. the albatross is dying in its nest. the worst trying to ruin the best, the best. They could never ever take it to the real ball game. It's fatal and it don't get better! Someone always brings it down, down. For them it's inconvenience for me it's hell. The geriatric staff think we're freaks. It's got a small brain and it refuses to learn! 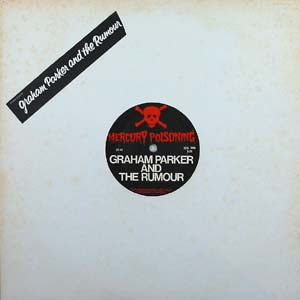 Now a triple live video treat from Graham Parker -- one original and two covers from the Mercury era: First, "Mercury Poisoning" from Japan in 1979... then "Hold Back The Night" from the BBC's "Top Of The Pops in 1977... and finally, "I Want You Back" (featuring some inaccurate voiceover in the beginning talking about Parker's first two albums "in 1969! ").